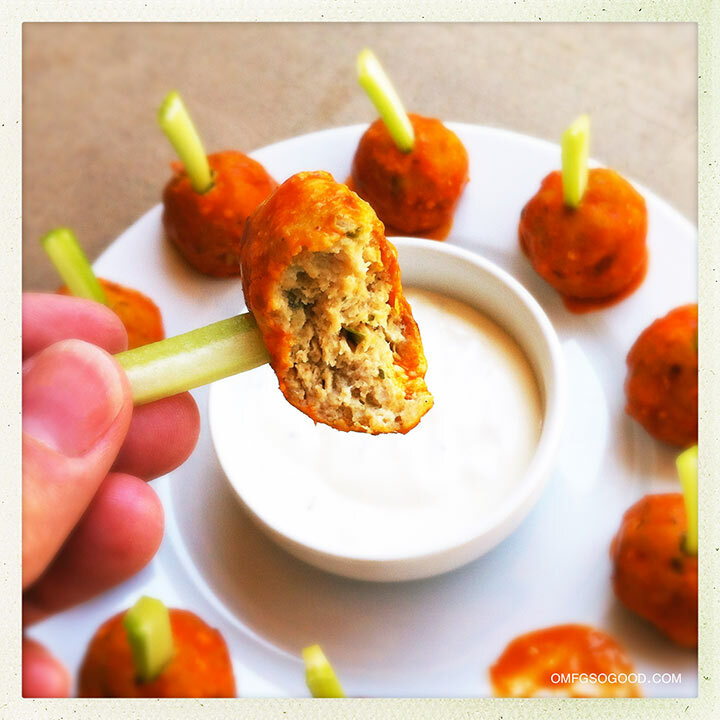 buffalo chicken meatballs | omfg. so good. Isn’t this the start of some sports season that people go bonkers over? Oh yeah, football. Here’s me coming clean. I’m not what you would consider a ‘girly-girl’ by any means, as a matter of fact, I’ve always had an affinity for perfectly worn-in jeans, t-shirts and Chuck Taylors… but I could care less about football. The only thing I look forward to during this ‘season’ is Sundays filled with a crap ton of fried appetizers and buffalo flavored goodies, and an excuse to drink cold beer at 2:00 in the afternoon. Thankfully, I’ve found my perfect match in Jonny, who happens to look completely at-ease in denim, owns every color t-shirt American Apparel produces, and prefers flip-flops over cleats any day. It’s actually one of the reasons I was drawn to him. Artsy boy doesn’t do the gridiron. Preheat the oven to 350 degrees. Line a sheet pan with parchment paper and set aside. In a large mixing bowl, combine the ground chicken, egg, crushed corn chips, green onions, garlic powder, salt and white pepper. Mix until thoroughly combined using a wooden spoon (or your clean hands.) 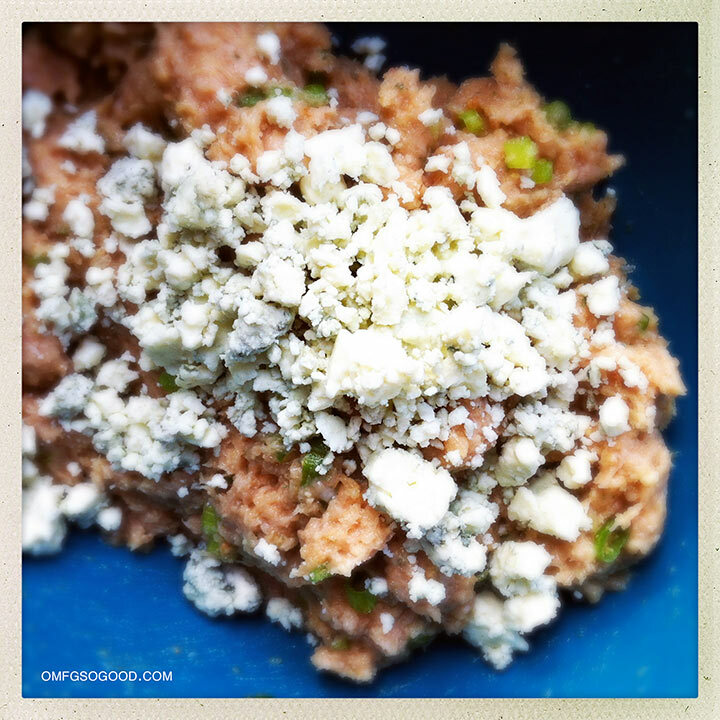 Add the crumbled blue cheese and gently mix it in to evenly combine. 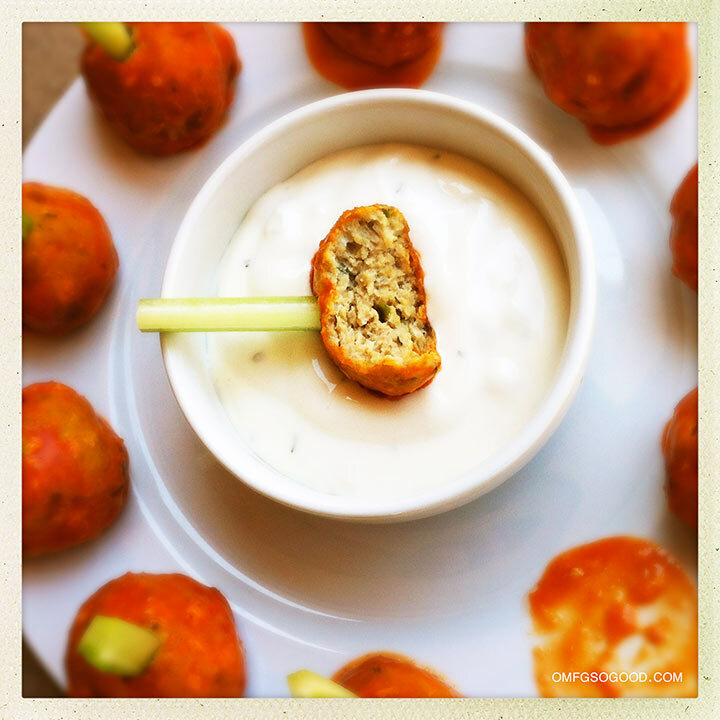 Form the mixture into 1 1/2″ round balls and arrange in a single layer on the prepared sheet pan. Bake in the preheated oven for 20 – 25 minutes or until golden brown. Transfer the cooked meatballs to a large saucepan and pour the buffalo wing sauce over top, gently toss to coat the meatballs evenly with sauce. Simmer over low heat for 15 – 20 minutes to soak those balls in deliciously spicy goodness (um, naughty sounding.) While the meatballs are simmering, slice the celery into small toothpick length pieces and set aside. 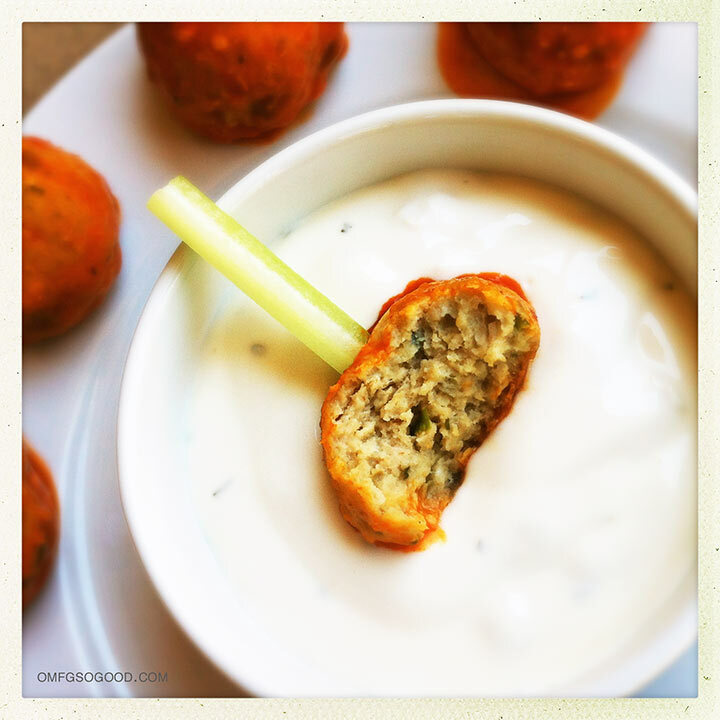 To serve, poke a celery stick into each meatball and serve alongside a bowl of blue cheese dressing. These would also make a fantastic Halloween party appetizer, considering they slightly resemble adorable mini-pumpkins. Maybe I’m a tad more girly-girl than I thought. Okay, I’m off to put my hair up in curlers and have a pillow fight with my bestie. Laters! 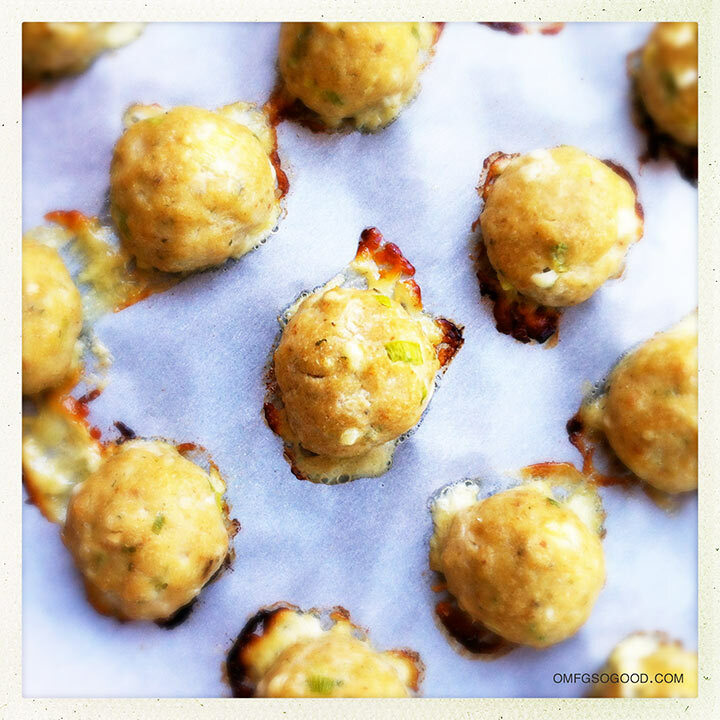 Pingback: Chicken Patties | For Oven's Sake! I’m going to try these! One question- are the corn chips. Tostitos type or Fritos?